The Impact of Moving – Avrick Consulting, Inc.
Everyone knows how important relocation is to a shift in buying patterns. Depending on the length of move people change their pizza shops, dry cleaners, barber, hair salon, church, etc. A typical homeowner will spend $9,400 within three months of moving. Renters will spend nearly $4,000. Not surprisingly, a month or two before the move the homeowner shops for a new mortgage, title insurance and homeowners insurance. A month before the move they contact a home security company. Within six months after the move they hire a lawn care company or gardener. With so many purchases being made within this six month period, pre–movers and new movers represent a major opportunity for many of the nation’s marketers. 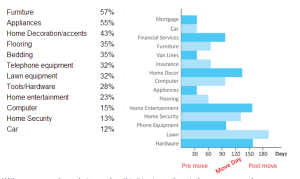 Moving drives many obvious purchases, but as you can see from the statistics, it also influences many less obvious ones. 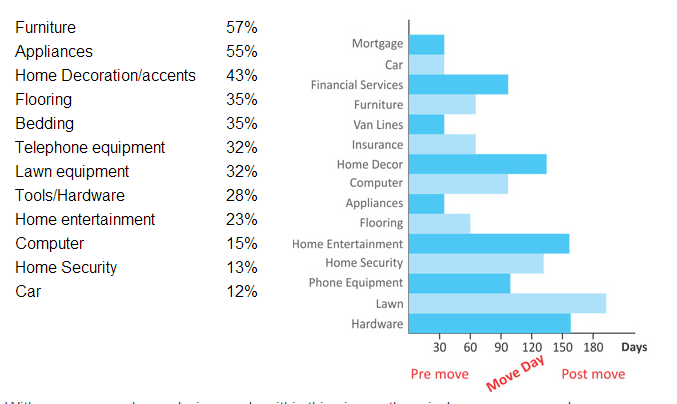 New mover lists continue to represent the most frequently mailed type of list in the nation. We recently published a white paper about this, with information about new movers: who, why, when and where; and the marketing opportunities they present.